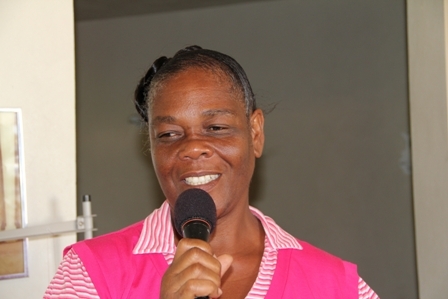 NIA-CHARLESTOWN NEVIS (August 19th, 2011) — Six women are at present benefiting from a three week Industrial Sewing Workshop which commenced at Ramsbury on Monday. The course is an initiative of the Small Enterprise Development Unit (SEDU) in the Ministry of Trade on Nevis funded by the Caribbean Development Bank. Business Development Officer of SEDU Ms. Lorencia Tyson said at the opening ceremony, that the workshop was sparked by the interest of the participants and would serve to enhance their knowledge and skills in garment construction with the expertise of the facilitator Ms. Marie Mason. 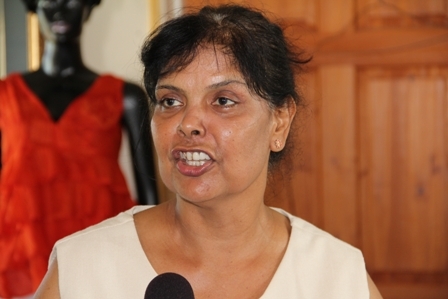 “In an effort to address challenges being faced by the garment producers and in keeping with its mandate in providing technical assistance to small businesses in Nevis, the Small Enterprise Development Unit has applied for technical assistance under the Caribbean Technological Consultancy Service better known as CTCS Programme to the Caribbean Development Bank in Barbados. 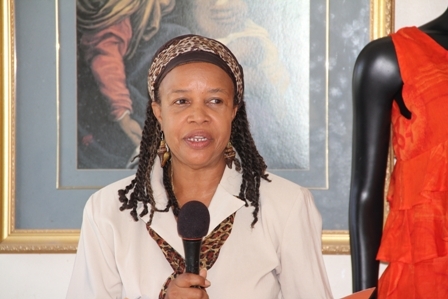 “The purpose of this technical assistance is therefore to provide training to these six garment producers aimed at enhancing their knowledge and skills in garment construction and empowering them to produce marketable custom made garments,” she said. 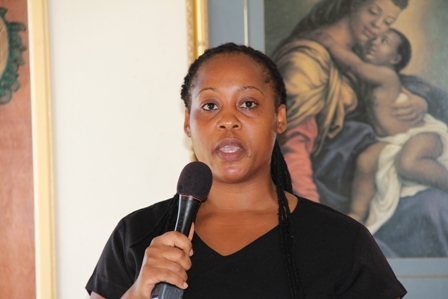 Ms. Mason who has been a consultant with the CDB for the past five years said she had been sent outside of Nevis to share her expertise but was grateful for the opportunity to do the same in Nevis. She described the three-week course as an advanced course for persons who could already sew but would take them to the next level and prepare them to open their own business. “In industrial sewing we are sewing for the industry as well as you are learning to use industrial sewing machines and other machines along with the surges. In week one you will be learning the control, care and maintenance of both the domestic and industrial sewing machines, how to use the basic tools, proper measurement in making basic patterns. “We will make a pattern to sew a short sleeve shirt or a sleeveless blouse that will be in the first week and making a skirt pattern and sewing a short skirt with a zipper,” she explained. According to Ms. Mason, in the second week participants would be exposed to making dress pants with pockets and zippers, waistline, interfacing and buttons and buttonholes will be added. The basic knowhow will be given for making well fitted trousers and helpful hints will be given on pressing to achieve a professional finish to the garment. Construction of a tunic will also be taught because in Ms. Mason’s view school uniforms were very important in Nevis and therefore participants would be given the opportunity to make a basic tunic. “In the third week we will make a pattern for lined long sleeved and short sleeved jackets which includes buttons, buttonholes, pockets, lining to give it a professional finish. “Inspection of the finishing projects during the last week will be completed and we will give everyone an opportunity to complete their unfinished projects. 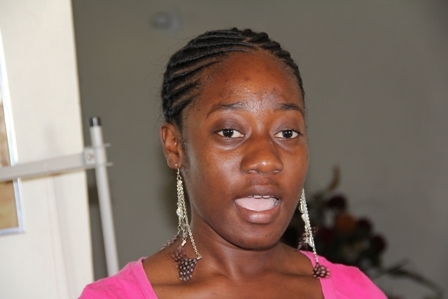 We will have a closing ceremony and we will be giving out certificates to everybody,” she said. In conclusion she told the participants though the planned overview of the course was not hard and fast rule because if time permitted she would introduce them to other things or show them how to make more items. She said sewing was fun and that approach to sewing would make learning easier. Meantime, some of the participants gave their impressions of the workshop. “I am very happy to join this workshop. I am very happy to use this heavy duty machine and I am thankful that I will get the opportunity to do it and I always like sewing but sometimes my patience runs out but since I am here with all the ladies we will have competition. We are learning and I guess this is where we will put out our skills so I am thankful and grateful for this opportunity,” Vallie Nankishoe said. Ms. Lornet Brandy was also pleased for the opportunity to further her knowledge in sewing. “I am so happy for this opportunity I always needed to go further in my sewing and I always wanted to know how to cut because I could sew but I can’t cut so I am so happy for this opportunity. I am glad that it came about and I will make the best of it,” she said. The youngest participant Ms. Lenore Mogent noted she had taken up sewing since she was in 3rd Form. “I have been sewing for quite a while now from since 3 Form actually and to me it has always been fun and I heard about this workshop two weeks ago thankfully but unfortunately a friend of mine dropped out and I came in. “I am blessed to be here and I think this will be a great experience so for anybody else out there who wants to learn sewing you should contact Ms. Marie Mason she is a great person and she knows alot. I am thankful to be here,” she said.